Desserts @ Canelé Pâtisserie Chocolaterie, Scotts Road. We’d passed by this place umpteen times when you are in Orchard but neve tried their stuff before, be it dine-in or takeaways. Partly because the prices were on the exorbitant side by our standards. But since we are on a mini pâtisserie craze, we couldn’t resist trying their beautifully crafted desserts! 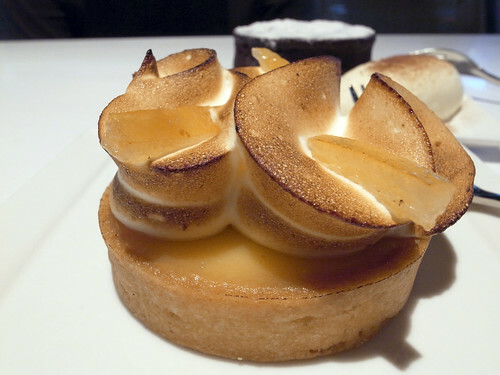 Tarte Citron, made up of lemon cream in an almond tart base with caramelised Italian meringue and candided lemon rind. We ain’t particular keen on a lemon dessert but were immediately drawn to the dramatic presentation of the piece when we saw it. In spirit of photography (sounds weird I know! ), we decide to give it a try. To our surprise, the lemon cream is such a delight, being tarty and sharp which elegantly compliments the sweet smoothness of the Italian meringue. And the meringue is quite a character by itself, piped artistically showing off her curves which reminds of the flares on a flamboyant and seductive Flamenco bailaora’s rociera. Candided lemon rind strips are used to embellish the “flares” and they are not purely for just aesthetics! Being both tangy and sweet, the subtle flavours from these petite topaz cuts linger in the mouth while the rich aroma from citrus oil that oozes out travels up the nasal cavity, heighterning the gastronomic experience. In short, Tarte Citron is a piece which is both of style and depth! Since Canelé is also a Chocolaterie, we felt obliged to try a chocolate dessert at Canelé, and Fondant chocolat with crème Chantilly appears to be the candidate of choice…or so we thought. Fondant Chocolat, often touted as a case of accidental innovativity, is much like how cavemen discovered barbeque if you ask me. This dish spread like wild fire and became popular all over the world within a short time. Our order of Fondant Chocolat was served minutes after Tarte Citron and rightfully so for several reasons. Flavours from a fruit dessert are generally more subtle and delicate than a chocolate-based one, while chocolate tends to musk or if not, make mild any other flavours around. So sampling the Tarte Citron first seems more sensible. 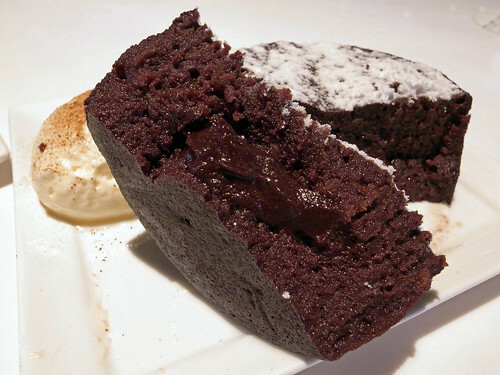 However, in some restaurants (at least the more decent ones who make the effort that is), Fondant Chocolat is a “made-to-order” dessert, which takes about 15 minutes or so to bake with a pre-mixed batter. Canelé‘s Fondant Chocolat is made with premium dark chocolate, whose full-bodied bittersweetness blends well the subtle sweetness of the crème Chantilly. But there’s a major blooper. Its version was pre-fabbed, with the crème Chantilly already on the serving plate on display when we ordered the dish. This meant that the cake was already half-cooked. But wait a minute, Fondant Chocolat IS suppose to be half-cooked! Reheating the cake would cook it futher making it less “lava-like”, and hence less gratifying. This would overcook a cake which needs to be undercooked! And that was exactly what happened to our serving. Overall, a very enjoyable Tarte Citron, and a not-so gratifying Fondant Chocolat. You just can’t win ’em all, can you? 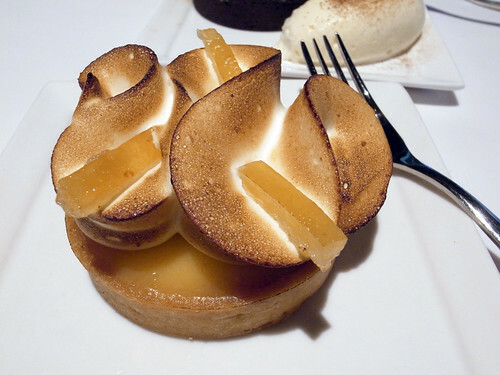 This entry was posted on December 26, 2010 by Alan (travellingfoodies). It was filed under Food and was tagged with Scotts Road, Singapore.